The art of engraving Chagall comprehended in Berlin, from Herman Struck, who wrote a classic study on this subject. Engaged sometimes engraving on wood and lithography, he still preferred them to etching. 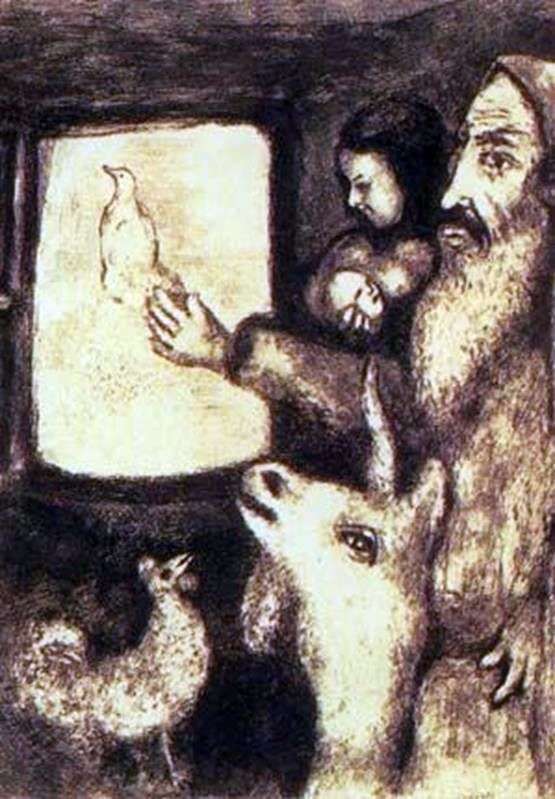 It was in this technique that Chagall created his famous illustrations for Gogol’s Dead Souls, Lafontaine’s Bibles and the Bible. An illustration depicting Noah releasing a dove in the window of the Ark is taken from the Bible. Over these illustrations Chagall worked for several years. Unfortunately, the books that the client planned to release, Ambroise Vollard, remained unreleased. Vollard died, and the outbreak of world war seemed to put an end to this project. And yet these books were held: “Dead Souls” appeared in 1948, La Fontaine’s “Fables” in 1952, and the Bible in 1956. Each of them contained about a hundred large illustrations. True, the print runs were scanty – 200-300 copies. As a book illustrator, Chagall adhered to his own principles, believing that the illustration should not retell the contents of the book, but rather offer visible images of what is being said about it. Description and meaning of the painting Book illustrations by Marc Chagall.